The year of 2011 saw the release of Dark Souls, the highly anticipated spiritual successor to Demon’s Souls. Developed by From Software, the game was met with tons critical praise as it provided a unique, one of kind Action-RPG experience. PC gamers however, were unable to get their hands on the game due to it only releasing on the PlayStation 3 and the Xbox 360. 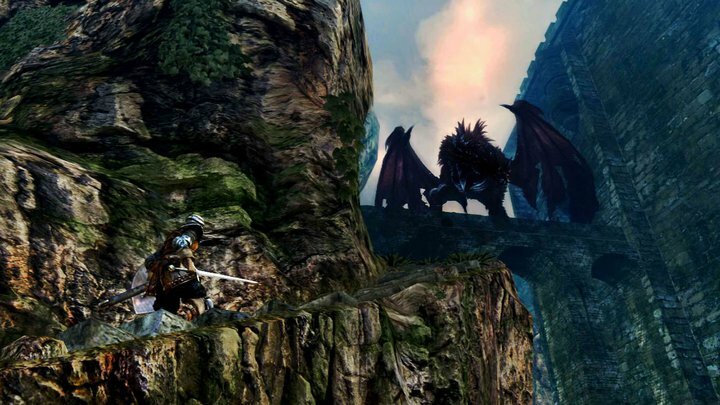 In a move to catch the attention of Namco Bandai and From Software, PC gamers rallied up a petition to bring the game onto their favorite gaming platform. Their efforts were not in vain as Namco Bandai finally announced Dark Souls: Prepare to Die Edition, an updated version of the original game, for the PC. 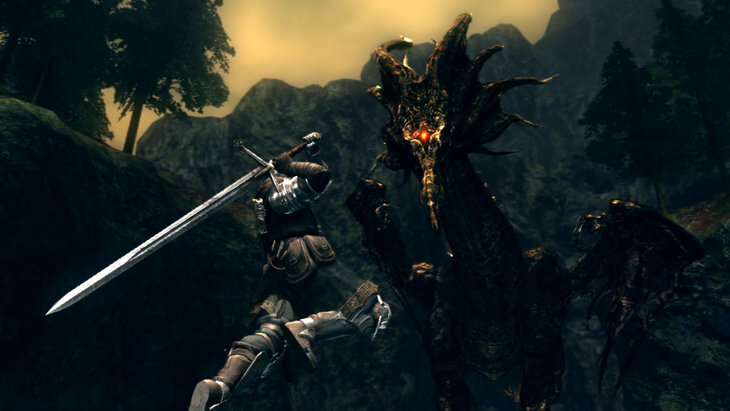 Unlike Demon’s Souls’ structured hub approach, Dark Souls is set in a huge open-world. As soon as you finish the introductory part of the game, you will be thrown into this massive world and left to explore it as you see fit. You can climb up towards Undead Burg or venture below to New Londo Ruins. There isn't a strictly guided structure as to how you should approach the game, but there are certain events that needed to be completed in order to further progress the story . There isn't much Story to Dark Souls in the traditional sense, as most of the game’s lore is hidden in conversations you have with various NPCs as well your own interpretations of what’s happening in the world. Lots of people disregard the story for being shallow, but in reality, if you dig deep enough you will eventually realize that the world is filled with background and history. Everything is subtly hinted at and you slowly build your own understanding for what exactly happened that led to such a dark and gruesome world. If you haven’t already heard all the talk about this game’s difficulty, then let me clarify something first. This game is hard. It’s harder than every other game out in the market right now. Contrary to what you may think, the game doesn't cheat you in difficulty. It simply teaches you its ropes through the best mechanism there is, Death. Death is crucial to Dark Souls and that might be a bit too hard to understand the first time you play the game. You might get frustrated by how challenging the game is and how nearly everything you encounter in this world is desperately trying to kill you. However once you start to get a hold of the game’s mechanics you will soon realize that the game’s difficulty is justified. 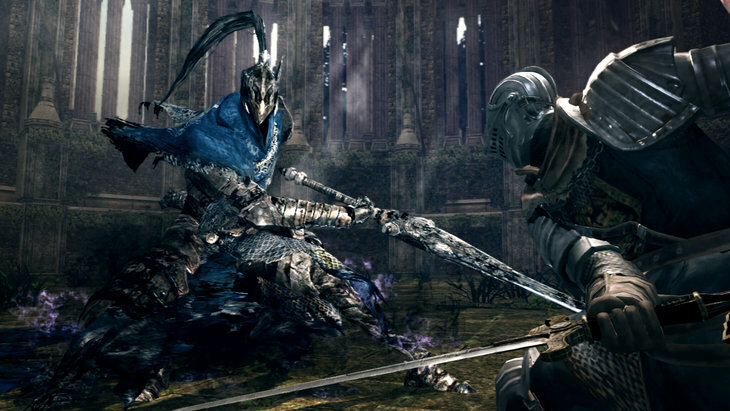 Combat in Dark Souls has a sense of weight to it while still being both tight and responsive. You can’t go off mashing away buttons to kill off your enemies as that will most probably render you dead. Even weaker enemies in large amounts can be lethal. Dark Souls can be best described as a clever waiting game. You need to react and read your enemies rather than recklessly swinging your sword around. The game forces you to think, because if you don’t it will keep killing you until you do. This is a breath of fresh air for players looking for a challenging experience as Dark Souls is one of the few titles that manage to implement difficulty in such an engaging way. While the game does allow you to use a mouse and keyboard as a control option, a controller is highly recommended. The mouse and keyboard controls aren't implemented well enough and might be frustrating to use at times. This might be a deal breaker to some people but using a controller is essentially the optimum way to ensure that your experience does not suffer as a result. The game's boss and enemy design are simply amazing and blend perfectly with the game’s world. Dark Souls has, what is quite possibly, the best boss design I have ever encountered in a Video Game. The diversity of the bosses you fight is mind boggling to say the least. Not only do the bosses differ from each other, but the way you need to fight them makes each a memorable fight. Enemies in the game also come in all shapes and sizes ranging from hordes of undead to man eating trees. Having such unique designs throughout the game keeps gameplay exciting by having you experience a wide variety of content. 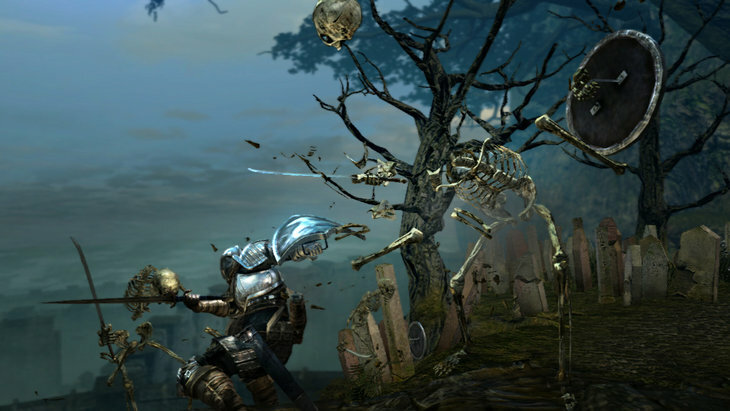 Dark Souls implements online connectivity in two different ways. First, it allows players to leave messages on the ground for other players to find. These can range from “watch out for what’s coming” to “safety ahead". Secondly, the game also allows you to invade other players’ worlds and vise versa. These can make for some really fun Player vs Player moments and the rewards you receive from participating in them are huge. New to the PC version is the PvP Arena, which sadly doesn't work as well as I hoped it would. Matchmaking doesn't function so well and it’s often hard to get a proper fight going. This feature is certainly a disappointment, as it could have potentially added a new dynamic to the game's content offerings. As an updated version of last year’ hit, Dark Souls: Prepare to Die Edition includes brand new content that was not included in the original game. The content is seamlessly woven in the game’s world making it feel like it has always been there in the first place. The new content can only be accessed after a certain point through the game and adds in around 10 hours of gameplay. This makes the already huge world of the game much more exciting to explore as it allows you to venture off and fight brand new enemies and bosses. Dark Souls: Prepare to Die Edition is undeniably a weak PC port. It doesn't utilize much of the platform’s vast offerings and developer From Software’s inexperience with the system shows up in every way. That however doesn't stop it from being an amazing Action-RPG experience. Its gruesome dark world, fantastic combat, and excellent boss and enemy design are just too good to resist. The additional content is woven together really well into the game’s world and expands upon its already lengthy offerings. With the current modding tools out there, you can get the game to run leaps and bounds better than its console counterpart. Dark Souls: Prepare to Die Edition, despite its operational hiccups, is one of the best Action-RPG titles ever made. Awesome review as always Dragoon, this is extremely professional and I may just buy the game now! is it harder than bayonetta? that game was pretty unforgiving as well. yeah, much harder. Bayonetta was pretty frikken great. Dat combat! Thanks! Yay, definitely go for it it's great! I bought a PS3 only for dark and demon's souls. Dark Souls is one of the best games I ever played, fantastic game and good review ! You did a really great job capturing the essence of the combat system and the difficulty in this review, as well as describing the structure of the game and lore well. Although I personally don't have any issue with the keyboard controls(though I do with the mouse), I think they did the best they could with the keyboard controls, it's just not a game whose controls translates very well. "This is not Warcraft in space" "It's much more...... Sophisticated" "I KNOW IT'S NOT 3D!!!" It's one of the best games I've ever played, and I've played A LOT of games. The sense of reward at killing a boss after many deaths cracking a strategy, character development, and the rich lore (if you take the effort to dig in it, or look it up in youtube), make this game amazing. The learning curve is also amazingly well built, at the start simple Hollow will kill you and you'll be like.. WTF? !, and on a second character you'll find it easy. It's also cool that even when very powerful most enemies can kill you if you get careless, it keeps you on your toes. There's no such thing as trash mobs on DS. I love it! Fantastic game! Dark Souls for the PS3 i'd give a 5/5 and would say its the best game i ever played on that platform. So after having such a great expirience with it and voting to get it to the PC aswell i was thrilled to find out it would actually be ported. Now i bought the game on Steam and it was horrid, i remember starting up the game and quiting it 5 minutes later. That i did to a game i played over 300 hours on the PS3. Since there are some mods out there that make it work better i'm propably going to play it again when i have a working controller for my PC (does a PS3 controller work for PC?). I really hope i wont have to stop playing again after 5 minutes :/ this game is so good its a godsend. Yeah use the mods to get the most out of the game, and yes a PS3 controller works on a PC providing you install a program called motionjoy and the correct drivers. Thank you guys for commenting and I hope you found the review helpful! I'm covering a ton more games, so stay tuned! I already own Dark souls on PC but I badly wanted to do the same. Sadlly coudln't find Demon souls anywhere. The review is really good otherwise. and Yes, Dark Souls has to be the best Action-RPG I have ever played.